Winter is what separates a good fashion blogger from a great fashion blogger. Being able to withstand freezing temperatures in a tulle skirt, running between your tripod and your “spot” in too-tall high heels, and even being able to take outfit pictures in the elements is a feat unto itself. This post highlights tips & tricks I’ve picked up from my 6 years of keeping up various personal style blogs. 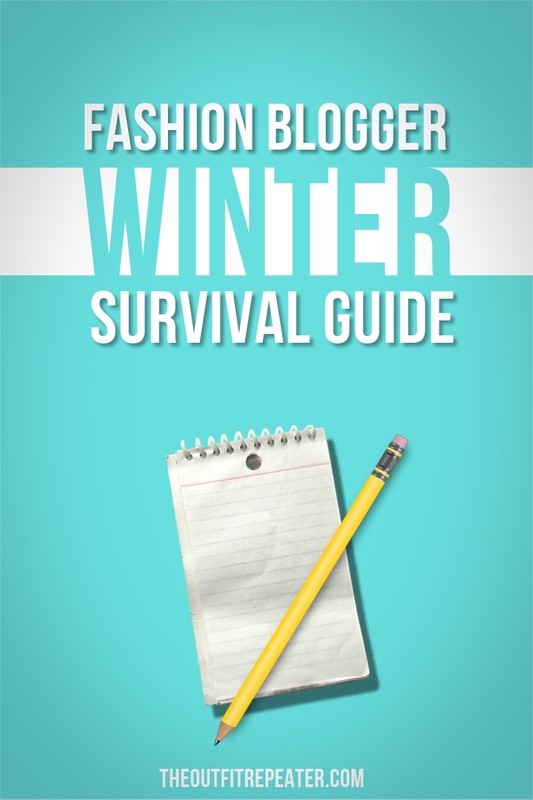 Get ready to take notes for surviving a fashion blogger winter! What you wear is half the battle of taking outfit pictures in a deep freeze. It’s wise to invest in super cute outerwear and prepare your readers to see it in every single outfit post for the next 6 months (or however long winter lasts for you). I’m not one to be boring, though, so here’s some practical ways to stay warm and stylish without becoming an outfit repeater like me. Hot Hands – For a buck a pack, store these in every pocket that you have. These babies deliver serious heat and I can’t recommend them enough. Fleece lined everything – You’re probably already wearing tights or leggings with your outfit, why not reap the benefits of wearing fleece-lined ones? Your legs will thank you. Gloves, scarves, etc – Even if you choose to opt out of photographing your winter accessories, it’s worth having some super warm pieces to wear between photos. Don’t forget to layer your clothes as much as possible. I add a lot of sneaky layers like long sleeves under my coats, doubling up on tights, and wearing thick socks with my shoes. You’d probably never guess how many layers I’m wearing in any single outfit because I’m a fashion ninja! Once you’ve become a pro with your clothes, it’s time to figure out how to actually navigate a photo shoot whether you’re solo with a tripod or you’re getting your pictures taken by a friend. Jump around – In the summer I try to stay as still as possible to avoid sweating, but winter? Winter is a whole new ball game. I’m usually marching my feet in pictures to keep my blood pumping or running in place before a photo. It’s the little things that help! Duck inside every few pictures – If you can brave the cold for more than 2 or 3 photos at a time, you deserve a medal. I can’t do that, however. So every few pictures, I run back to warmth. That may be a car, your house, or a nearby building. It’s not worth losing feeling in your fingers for a photo. Trust me! Listen to music – I keep my phone/music device close by when I’m snapping pictures. The music keeps my mind off of how cold and I am, plus it makes me feel less alone when I’m shooting by myself in places like the woods. Wear your coat as much as possible – I have been known to load myself into all my winter gear and then toss it right before I take a picture or two. It’s a tedious process to put it on & take it back off but it keeps you moving and mostly warm, how can you argue with that? Don’t take outfit photos – If you’re struggling to face the wrath of winter, just don’t! There are still plenty of other topics you can talk about on your blog. Maybe you can come up with a fun collab for you and another blogger or perfect your review skills. It’s okay to skip an outfit or two – the world will not come to an end! What’s your best tips for surviving the winter as a fashion blogger? I’d love to hear your creative ideas in the comments. Thanks for reading!